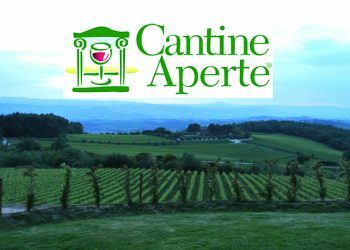 I have a backlog of easy appetizers to share that I have been making over the past few months while we’ve been hosting wine tastings with our farmhouse guests here in Umbria. I like to keep my recipes seasonal and while in the spring I may use fava bean puree on my bruschetta, or make a frittata with tiny wild asparagus, in the fall I’m thinking more of Bruschetta With Melted Local Cheese & Sausage, or Stuffed Mushrooms With Sausage & Chestnuts (recipes coming soon!) 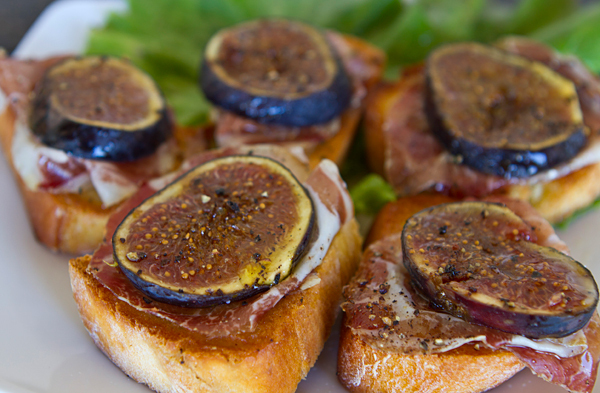 We have been enjoying an abundance of fresh figs lately, so I decided to incorporate figs into a simple bruschetta. Since figs are sweet, I needed to balance the flavor with something a little salty so paired the figs with paper thin slices of Capocollo. 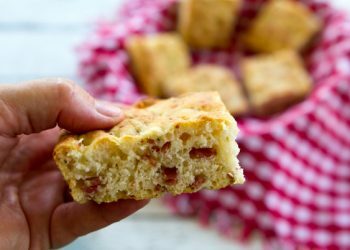 This is yet another appetizer that can be pulled together in minutes as long as you have the right ingredients. Capocollo is often sold in a mild or sweet form or spicy and for this bruschetta I chose the mild version. Capocollo is a traditional Italian cured meat made from the shoulder or neck of pigs. Though similar in flavor to prosciutto, as both are from pigs, prosciutto is made from the thigh or buttock of a pig or wild boar while Capocollo is always made from the shoulder or neck. 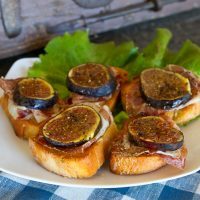 I happened to find black figs at my local market the day I made these bruschetta, but any fresh, ripe fig will work just fine. 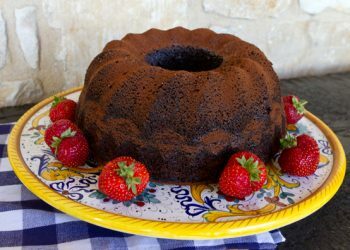 I also used chestnut honey as it has a rich flavor but you can use any full flavored honey. 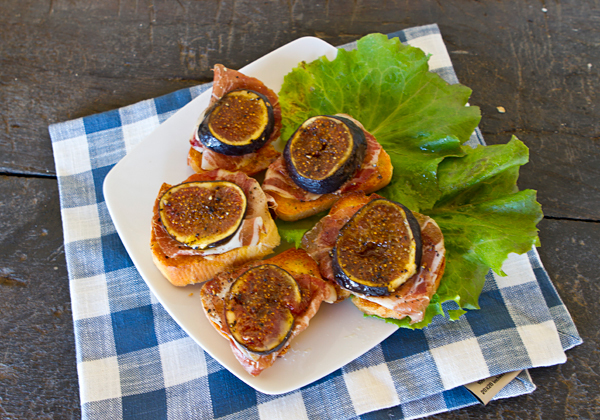 Sweet fresh figs are balanced with salty capocollo in this quick and easy appetizer. Cut 8 slices from the bread and lay on a baking sheet. Lightly brown both sides of the bread slices under the broiler, then brush one side lightly with the olive oil. Arrange the bread slices on a platter and place two slices of the capocollo on each oil brushed side, folding the meat over if needed to fit. 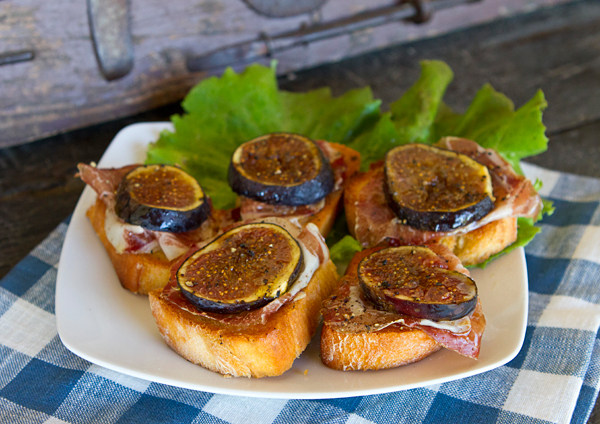 Slice the figs crosswise, and top each bruschetta with a slice of fig. Warm the honey and drizzle a little over each of the bruschetta. Use a pepper grinder to top each bruschetta with some fresh cracked black pepper. These look absolutely divine. Will you please share with us your thoughts on best wine to pair with this recipe? Elisa, glad you like it! I think a fruity white wine would be lovely with these bruschetta. Thank You, Deborah. I made these and took them to the park last night to enjoy the last days of summer with a Friend. I ended up making a peach sangria using fresh Washington State peaches. It was a DELICIOUS treat! Thanks again! Elisa, glad you enjoyed it, and I bet the peach sangria was delicious! Sounds yummy, Deborah. 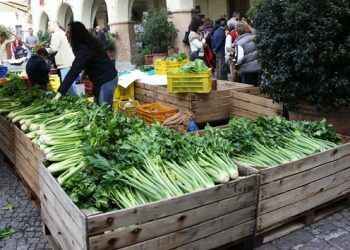 Good fresh figs are not as easy to find here in “Stati Uniti” as they are in Italy. 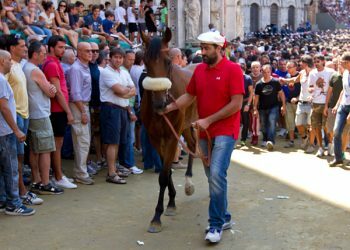 Same for well prepared capo (spelled capicollo or capicolla here). Excellent prosciutto is easy to find, however, so we only have to improvise on the fruit. As persimmons (cachi) come into season, they make an excellent accompaniment to proscuitto. It is critical, though, to select the correct variety of persimmon. Basically, there are two—astringent and non-astringent. The astringent are the heart-shaped hachiya persimmons, and these must be allowed to ripen until mushy to eliminate the astringent tannins. They are NOT good with capo or proscuitto. The non-astringent are the tomato-shaped fuyu, and these are crunchy like apples and can be eaten when firm. Skinned and thinly sliced, fuyus have just the right amount of sugar to complement the saltiness of the cured hams. I never had any difficulty finding superb persimmons when we lived in Firenze. 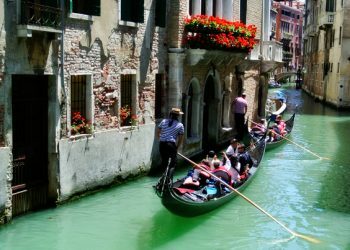 For wines, we have really enjoyed the barely effervescent prosecco, and its Portuguese counterpart, Vinho Verde. Both are superb pairings. 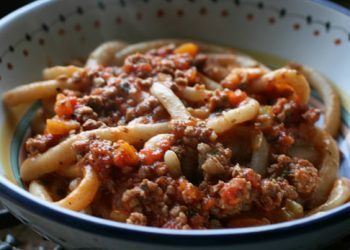 Oh this is what I will make my Dad for lunch on my visit on Saturday! He will love this… photos to come….